Though it was commonly used in construction for decades due to its ability to insulate and resist fire, today we know that the dangers of asbestos far outweigh its benefits. Asbestos fibers can lodge in the lungs if inhaled and cause serious long term health problems including cancer. 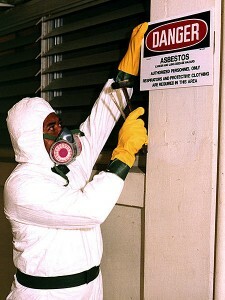 In order to keep your property safe from asbestos, some form of asbestos abatement in Palos Verdes CA will be needed. How Do I Know If Need Asbestos Abatement in Palos Verdes CA? If your property does contain asbestos, the next step is to assess the level of risk that the material poses. Technically, only a damaged material absolutely requires abatement, because it is actively contaminating your property. However, for ultimate peace of mind against future contamination, you should consider asbestos abatement in Palos Verdes CA for any and all asbestos-containing materials regardless of present condition. All of our workers are highly trained and conscientious about safety on the job. Our attention to detail ensures that every bit of asbestos gets taken safely off your property. We not only clean up all the waste you can see; we also clean up microscopic dust with our thorough wet and dry cleanup protocols. Our clients are able to pass inspections and secure reoccupancy clearances with ease because we leave properties so clean. Our asbestos removal office for Asbestos Abatement in Palos Verdes CA is open Monday through Friday between 8:00 AM and 5:00 PM and closed for lunch from noon to 1:00 PM. With advance notice, projects can be scheduled for weekends, early mornings and evenings.